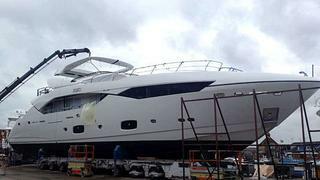 Sunseeker International in Poole, UK, launched the recently sold 115 Sport Yacht Zozo earlier this week. Fresh off the production line just a few days ago, this 34.53 metre superyacht, formerly known as the Predator 115, will be delivered to her owner in the Mediterranean this June. One of six 115 Sport Yachts to leave the factory in 2013, Zozo offers the standard 115 layout with five cabins accommodating 10 guests, an expansive saloon with side deck balconies and an exterior upper deck lounge and wet bar area. Her special features include a customised waterfall-inspired Jacuzzi and specialised lighting inside and out. Zozo is the third 115 Sports Yacht sold by Gary Cleaverly of Sunseeker London.